With AutoCAD 2010 & 2011, the default setting when you had “Dynamic Input”enabled was awesome. When you select an object and then hover over a grip, it would show you the length, radius & angle. This feature saves me time from having to either pull a dimension or using the DISTANCE or LIST command. In AutoCAD 2012 however, this feature was disabled and I was not a happy camper. But my frustration and curiosity has payed off. 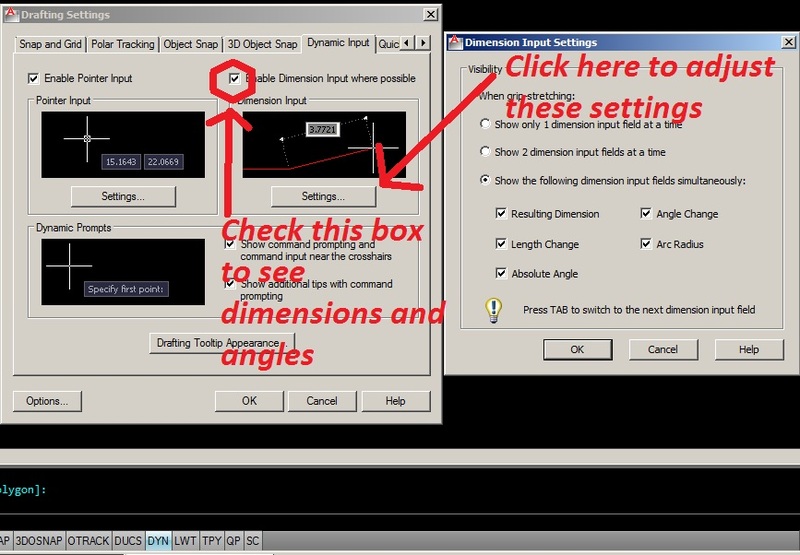 Click the “Dynamic Input” tab & then check the check-box next to “Enable Dimension Input where available.” this is all you need to turn back on the dimensions & angles. You can also change additional settings for Dynamic Input by clicking the “Settings” button. Now when you select an object, you will see a great feature of Dynamic Input!!!! This entry was posted in BASICS, Customization, Dimensions, New in 2012, TIPS. Bookmark the permalink. Hi, thanks for posting this but how do you get there from the command line? Hey Miguel, If you want to only know the command/alias it is “DSETTINGS” or simply “DS” to open the Drafting Settings dialog box. If you want to open the dialog box on a certain tab in a LISP routine, the following line of code will bring you to this specific tab (command “+DSETTINGS” “3”). Notice that the plus sign (+) before the DSETTINGS command allows you to specify the tab that you want. The number that follows the command specifies what tab to open. In this case the number 3 brings up this specific tab. In autocad 2012 is it possible to change the lenght of a line by overiding the dimension lenght? 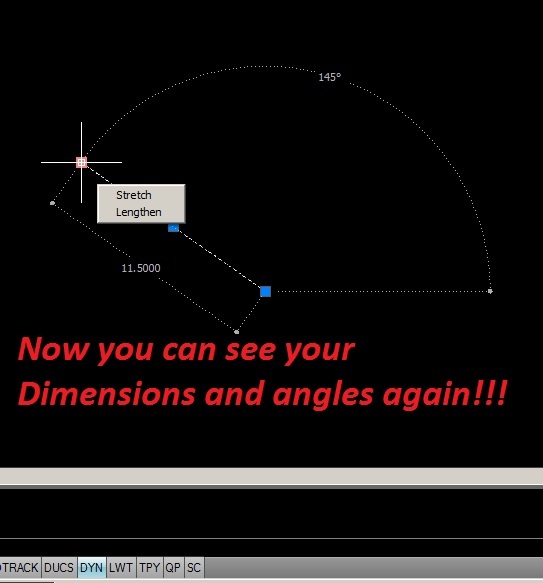 for instance in Autodesk inventor if I drew a 5inch line and annotated it, I could click on the dimension text and type 10in and press enter. When I do this the line automatically adjusts to a 10″ line.can I do the same in Autocad? Great question. Yes you can do this in AutoCAD. The thing that you need to do is instead of applying a regular dimension to the object, you apply a dimensional constraint to the object. These dimensions are located in the “Parametric” tab on the ribbon and have their own panel on that ribbon. The problem with these is that if you want to present them in some way, they look horrible. But I have made a blog post about how to change a setting for these dimensions to appear like normal (presentable) dimensions. Also note, that if you simply want these dimensions for their functionality, then there is a way to turn them on or off. Olá, sou aluna aqui no Brasil, do autocad,pois terminei meu curso agora,fiquei com algumas dificuldades, mas estou tirando algumas delas, por estas informações tão adequadas as minhas necessidades!! “Hello, I’m a student here in Brazil, of AutoCAD, because now I finished my course, I had some difficulties, but I’m taking some of them, for this information as appropriate to my needs! Thanks for visiting this blog. I am happy that you have found it helpful even when you have to translate it. I’m wondering if anyone knows how to associate dynamic input with a specific command. 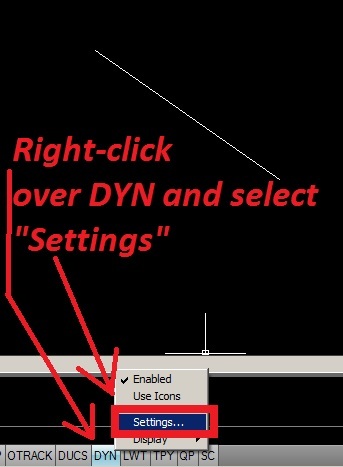 In AutoCAD MEP 2011 I don’t use dynamic input for normal drafting, but when I go to the distance command it is set to come on and go off after I exit the command. Do you know how to set this up in MEP 2012? Thanks! I did look into this and was curious to see the simple “macro” that is used to call the command. You can see this macro while in the CUI. the macro for this command is simply the MEASUREGEOM command. I was hoping that it was something more simple like calling the DYNMODE variable and then starting the MEASUREGEOM command. Because it is not, that means that it is something defined depper in the API which I do not know how to access. A more powerful programming language like c#.NET has more access to the API than that which is available in LISP or Visual LISP. So I am sorry that I don’t have a solution for you. Not having that turned on was bugging me too!! – Thanks Greg!